The court denied defendants' motion for summary judgment of no willful infringement of plaintiff's food mold patent and rejected defendants' lack of notice argument. "[Plaintiff] did not give notice of infringement until [2 1/2 years ago], even though the defendants had been advertising and selling the products for a decade or more. Most telling is that [plaintiff] accused Defendants of infringing other patents, but did not mention the [patent-in-suit] until much later. . . . Although the defendants rely on [Kodak Co. V. Agfa-Gevaert N.V., 560 F.Supp.2d 227 (W.D.N.Y. 2008)], that decision was issued after a seven-day trial. Nowhere in that opinion does it suggest that, as a matter of law, a defendant cannot be a willful infringer if the patent holder does not give notice of infringement for a given number of years. . . . Here, there is no indication that (1) [plaintiff] knew of the infringement for a lengthy period of time; and (2) [defendant] knew that [plaintiff] knew." The court denied in part defendant's motion to exclude the opinions of plaintiff's damages expert as to a royalty base, and rejected plaintiff's argument that only directly infringing units could be considered. "[Defendant] argues that [the expert] uses an inadmissible unit base of every unit sold. . . . [and] emphasizes that no Apple units directly infringe. . . . [The expert's] 'all infringing unit' base is not methodologically flawed. [Defendant] does not cite to a single case suggesting that the royalty base of a hypothetical negotiation must be limited to units deemed to directly infringe. Such a rule makes especially little sense in cases like this one, where indirect infringement by the defendant is alleged and the bulk of the direct infringement alleged is that of third parties." The court denied defendant's motion to stay pending CBM review and found that the NPE plaintiff would be unduly prejudiced by a stay. "Although it is true that [plaintiff] does not actively practice the patents and, therefore, does not compete with [defendant], it is also true that the longer [defendant] is allowed to engage in allegedly infringing activity, the lower the value of the patents becomes as licensing assets. Moreover, the patents-in-suit are set to expire in [2 years] and any delay in determining their validity significantly prejudices [plaintiff's] ability to license the patents." The court denied defendants' motion for summary judgment of noninfringement based on divided infringement and rejected the argument that steps performed by an end user could not be under defendants' control because the end user could have chosen noninfringing options. "[D]efendants point out that the clients 'may choose not to visit the accused websites' and 'the client browsers may be configured to connect to Defendants’ accused websites without using the accused . . . encryption algorithm.' While those points are true, they are immaterial to the question whether the claimed method steps performed by a client computer are performed at the direction or control of the defendants’ servers. . . . [Plaintiff] has offered evidence that if the RC4 algorithm is enabled on the clients’ browsers when the clients visit the defendants’ websites, the defendants’ servers will dictate that RC4 be used. If the clients’ browsers do not offer RC4 as an encryption algorithm, RC4 will not be used. However, that is not to say that that the client’s computer is not directed or controlled by the defendant’s server; it simply establishes that in such an instance no infringement takes place.. . . The defendants’ argument on this point is as flawed as the argument that when a physician performs a patented medical procedure on a patient that requires some action by the patient — e.g., swallowing a pill — there is 'divided infringement' because the patient could have decided not to undergo the medical procedure in the first place." The court granted plaintiff's motion to exclude the testimony of defendant's damages expert because of his royalty base analysis. "[The expert] notes that during prosecution, all elements of [plaintiff's] asserted invention except for three image-processing steps were found obvious in view of the prior art. Thus, [the expert] deems the three image-processing steps to be the 'inventive aspect' of the asserted patents. The Wii Remote’s direct pointing device ('DPD') is accused of practicing the three image-processing steps in combination with a Bluetooth microcontroller. However, [since] the Bluetooth microcontroller existed in the prior art [at the time of invention], [the expert] concludes, the proper royalty base is the DPD alone, and does not include the accused Bluetooth microcontroller or any other portion of an accused device. . . . [Defendant] argues the royalty base should only include products accused of infringing the 'inventive' aspects of the asserted patents. Thus, it maintains that [its expert's] report properly excludes revenue associated with components alleged to infringe claimed elements that the patentee did not invent. [Defendant's] position is unsupported. While it is sometimes necessary to apportion the smallest salable patent practicing unit to remove the value of unclaimed elements, [defendant] has not cited any precedent permitting the complete removal of the value of claimed elements. . . . [Defendant's expert's] royalty base must include the value of all claimed elements." The court sua sponte imposed a "a limited prosecution bar regarding all reexaminations, inter partes reviews, and any other post-grant review proceedings" to address the "growing proliferation of parallel proceedings between federal trial courts and the Patent and Trademark Office . . . [and] the Federal Circuit['s] [recognition] that 'strategically amending or surrendering claim scope during prosecution' can implicate competitive decision-making . . . thus giving rise to a risk of inadvertent use of confidential information learned in litigation." "[I]n an effort to balance a plaintiff's need for coordination among its counsel with a defendant's appropriate concern over the security of its proprietary information in the context of a protective order . . . the parties shall operate under a limited prosecution bar regarding all reexaminations, inter partes reviews, and any other post-grant review proceedings. . . . Plaintiffs shall designate one or more attorneys on their trial team who will be responsible for consulting with counsel handling any administrative review process, in order to coordinate coherent and consistent positions in various proceedings. . . . [O]nce any such person has viewed defendant's highly confidential source code, the prosecution bar set out in this order shall apply to such persons. . . . This order shall remain in effect until one year after final termination of this litigation." The court granted a manufacturer defendant's motion to sever and transfer venue from the Eastern District of Texas to the Western District of Washington. The interests of justice factor weighed in favor of transfer because of plaintiff's litigation tactics. "[T]he litigation tactics [plaintiff] has employed in an attempt to maintain venue in this District are now in clearer focus. Those tactics have not supported the interests of justice. Defendants have had to wait nearly two and a half years to have their motion to transfer properly heard. . . . Even though neither [plaintiff] nor [movant] had ties to this District, [plaintiff] filed suit in this Court alleging infringing acts against not only [movant], but also nineteen Retailers . . . located almost entirely in the eastern half of the country. . . . Tellingly, [plaintiff] did not accuse other major retailers like Amazon.com, Costco, Fry’s, or eBay, which are located in Washington and California. [Plaintiff] then used the presence of the accused Retailers to argue that the case should not be transferred. It also added claims against the Retailers regarding non-[movant] products and used the presence of those added claims to argue that the case against [movant] should not be severed. Now, [plaintiff] argues that it should benefit from the judicial experience gained during the nearly two and a half year delay it perpetuated. [Plaintiff's] tactics are not in the interest of justice, but contrary to it." The court denied plaintiffs' motion for supplemental claim construction following Nautilus, Inc. v. BioSig Instruments, Inc., 572 U.S. ___, No. 13-369, slip op. (June 2, 2014) addressing indefiniteness. "Plaintiffs are correct that the Supreme Court recently announced a new standard for indefiniteness under 35 U.S.C. § 112. Although Plaintiffs raise concerns regarding the indefinite nature of 'central area' in their motion for supplemental construction, that argument was not presented in their opening claim construction memorandum and Plaintiffs have failed to provide a sufficient justification for this untimely argument. . . . The Federal Circuit has since affirmed the Court’s construction of one of the terms identified in Plaintiffs’ motion and the Court is not inclined to revisit any of its constructions at this time." The court denied the parties' motion to vacate the court's earlier Rule 11 sanctions order following settlement. "The Court appreciates the parties’ willingness to enter into settlement negotiations, as well as the fact that these negotiations have been successful. However, the parties make an unusual request as part of the settlement, namely, to vacate a properly issued order without any indication that the underlying factual or legal bases for the order were incorrect. The parties do not explain why this request is necessary or appropriate. . . . Plaintiff filed this case in a public forum. The motion for sanctions was fully briefed through unrestricted filings. Had the parties wished to resolve the dispute at issue in a private forum, such as through binding arbitration proceeding, they were at liberty to do so." The court granted in part plaintiff's motion for summary judgment that defendant's infringement claims for three of its data storage patents were barred by patent exhaustion even though the sales from defendant's predecessor's licensees to plaintiff occurred overseas. "[W]hile the mere purchase of an item overseas that embodies a U.S. patent may not give the purchaser a right to import it into the United States, here [the licensee] had such a right under the parties’ negotiated license agreement. [Defendant] does not suggest that if [the licensee] itself had shipped the products to this country prior to resale, there still would have been a viable infringement claim against [the licensee] or any of its customers. . . . [The licensee] already gave consideration for the right to import devices embodying the patented inventions. That title to the chips passed before the shipping to this country took place is too thin a reed on which to permit the patentee an 'end run' around the principle that it may only recover once." The court denied defendant's motion for claim construction as unnecessary where defendant's sole dispute was indefiniteness and the court previously denied defendant's motion to amend its contentions to include a claim of indefiniteness. "[T]he issue before the Court is whether a party that does not assert indefiniteness in its invalidity contentions . . . nonetheless can argue during claim construction that certain claim terms are indefinite and, therefore, the patents-at-issue are invalid. . . . If a court were to allow a litigant to first assert this defense in the context of a motion for summary judgment following the completion of fact and expert discovery, the court would effectively render the 'use it or lose it' provision of Rule 12 meaningless." The court granted defendant's motion to stay pending inter partes review, but conditioned the stay on defendant agreement to be bound by estoppel. "Typically, the benefit of a stay pending IPR is contingent in part upon the IPR proceeding’s estoppel effect, i.e., the prohibition that the petitioner is precluded from relitigating the same issues that were raised or reasonably could have been raised during the IPR proceeding. . . . [B]ecause [defendant] is not a party to the relevant IPR proceeding, [defendant] is not necessarily bound by this statutory provision. Considering the position of the parties, the strategic options available to patent infringement defendants, and the relief [defendant] requests through this motion, as well as to fully appreciate the benefits of a more streamlined litigation, the court will condition a stay on [defendant's] agreement to be bound as if it itself had filed the relevant IPR petition." Does the lack of estoppel from third-party IPRs weigh against staying parallel litigation? The court granted defendants' motion to stay pending inter partes review and rejected plaintiff's proposal to condition the stay on defendants' agreement to be estopped from raising the same arguments as the IPR petitioners. "[A]lthough Plaintiff suggests it would be unfair for Defendants to obtain the benefit of IPR proceedings without being bound by the arguments raised therein, it would be more unfair to condition a stay on Defendants’ being bound by arguments raised in a proceeding over which they have no control. Defendants decided not to pursue IPR of the patents-in-suit on their own; they therefore run the risk that an unfavorable IPR decision — which they could have, but chose not to influence — will become part of the patent’s file. They also ran the risk that IPR would not be sought in the first place. Now that multiple non-parties have sought IPR of the patents-in-suit, and that the PTAB likely will apply its expertise to some or all of the arguments at issue in this case, it would defy common sense for this litigation to proceed alongside the IPR proceedings simply because Defendants are not statutorily prohibited from raising the same or similar arguments as the IPR petitioners." The court denied without prejudice defendant's unopposed motion to stay pending inter partes review. "Third parties . . . have filed a petition for inter partes review of the [patents-in-suit]. . . . [T]he PTAB proceeding is at an even earlier stage than this litigation – it will take the PTAB up to three months from now to determine whether or not to institute the inter partes review at all. Whether a stay will simplify the issues in question and trial of the case is wholly unpredictable, if not completely speculative, at this time. . . . Even assuming the PTAB does institute the inter partes review, that [defendant] is not a party to the PTAB proceeding casts doubt on the extent, if any, a stay will simplify the issues in this case by way of the estoppel effect of the administrative proceeding." The court granted in part defendant's motion for protective order regarding the deposition of party witnesses but imposed limits on the number (8 per side) and duration (7 hours) of non-expert party depositions. "If the Court permitted all of the discovery contemplated, the costs could be enormous and might effectively prevent one or both parties from pursuing the merits. . . . [T]he Court cannot precisely say how much the non-expert discovery might cost. But if both sides engaged in reciprocal scorched-earth discovery, the Court envisions fact deposition expenses alone in the many hundreds of thousands of dollars for each side. Add written and document discovery, discovery from third parties, and expert discovery, and the discovery expenses could easily mushroom into the millions of dollars. The parties, individually and together, have not convinced the Court that the likely benefit of this discovery outweighs the expense." The court granted plaintiff's motion to compel discovery concerning the profitability of defendant's trucks which contained the accused storage box feature because the discovery was relevant to damages. "Plaintiffs state that they have requested documents relating to gross and net revenues and profit margins for Dodge Ram trucks that are equipped with the RamBox for model year 2009 to the present. Defendant has refused to produce the revenue information that Plaintiffs sought, asserting that the information was not relevant. . . . Defendant argues that, in cases where an invention is part of a larger product, as the storage box here is part of a truck, then the damages should only be calculated by how much profit is made on the smaller invention. That rule is the general rule. . . . 'The entire market value rule is a narrow exception to this general rule.' . . . [I]f Plaintiffs were to succeed in this case, Plaintiffs should not be able to recover more than the reasonable royalty rate without a sufficient showing that the storage box drove sales of the trucks themselves. The Court recognizes the risks of requiring Defendant to disclose profits of the trucks. But the Court is confident, upon a more appropriately timed motion in limine, that it can sort out the proper damages method." In a final written decision, the Board rejected the patent owner's argument that the Board should give a declarant's testimony "less weight" because the declarant was hostile to the patent system. "[The patent owner] argues that [the petitioner's declarant] has 'hostility towards the patent system' and is a member of the Electronic Frontier Foundation (EFF), which shows a 'level of bias that should be more than sufficient to raise concerns about his qualifications to serve as an unbiased technology expert.' We have reviewed [the petitioner's] curriculum vitae and find that he is well qualified to testify regarding the matters addressed in his declaration Indeed, [the patent owner's] declarant . . . testified that [the petitioner's declarant] is a 'top cryptologist' and has a 'great reputation as a cryptologist.' . . . [W]e find [the expert's] testimony persuasive and give it substantial weight. We do not give it less weight based on a purported bias against patents in general." The court denied plaintiff's motion to file under seal an affidavit in support of plaintiff's motion for attorneys' fees. "Plaintiffs contend that 'the fees charged for each attorney as well as information contained in the time entries are confidential and private financial information of Plaintiffs and Plaintiffs’ counsel and is not publicly available information.' . . . Plaintiffs have not cited the Court to any basis for finding that the rates charged by Plaintiffs’ counsel are privileged, especially where the Plaintiffs move the Court to award fees in Plaintiffs’ favor based upon these rates. . . . To the extent the Plaintiffs argue that the descriptions contained in the billing entries are protected by the attorney-client privilege or work-product doctrine, the Court finds that the Plaintiffs have failed to cite any specific entry that contains privileged information, and thus, the Court cannot undertake a meaningful review of whether specific entries are protected." The ALJ sua sponte extended the target date and ordered the parties to provide supplemental briefing due to a Supreme Court decision on invalidity filed after post-hearing briefing concluded. "[T]he United States Supreme Court issued its decision in Nautilus, Inc. v. Biosig Instruments (June 2, 2014). The Court held that the standard for determining indefiniteness as articulated by the Court of Appeals for the Federal Circuit under 35 U.S.C. § 112 ¶ 2 ('amenable to construction' or 'insolubly ambiguous') is improper and that the standard should be whether 'a patent's claims, viewed in light of the specification and prosecution history, inform those skilled in the art about the scope of the invention with reasonable certainty.' None of the parties in this Investigation addressed this issue using the standard articulated by the Supreme Court in their presentation of evidence or in their briefs." The court adopted defendant's proposal for a protective order that included a prosecution bar that extended to CBM review. 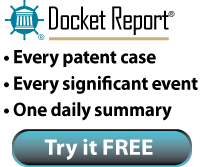 "If Defendant's petition for CBM review is granted, there is a significant risk that Plaintiff will make a motion to PTAB to amend the claims of its Patent 'to distinguish them from the prior art in a manner that is informed by its knowledge of [Defendant's] highly confidential information and source code gleaned in this litigation.'. . . [T]he potential misuse is obvious where Plaintiff has access to valuable and confidential source code, and could use such information to create a tactical advantage in this case. Plaintiff's possible injuries are minimal in comparison to the risk to Defendant. The injuries are minimized because Defendant's Bar applies only to Plaintiff's counsel that have seen Defendant's confidential material and source code. . . . Defendant's Bar allows Plaintiff's litigation counsel - who have not and agree not to review Defendant's confidential information or source code - to fully participate in the CBM review proceeding, including motions for claim amendments." The court granted defendant's motion for attorneys’ fees under 35 U.S.C. § 285 against an NPE plaintiff because plaintiff's suit had been a "prototypical exceptional case." "No reasonable litigant could have expected success on the merits in [plaintiff's] patent infringement lawsuit against [defendant] because the [patent-in-suit] claimed a bilateral matchmaking process requiring multiple parties . . . while [the accused] feature utilizes the preference data of only one party. . . . And the most basic pre-suit investigation would have revealed this fact. . . . [Plaintiff's] motivation in this litigation was to extract a nuisance settlement from [defendant] on the theory that [defendant] would rather pay an unjustified license fee than bear the costs of the threatened expensive litigation. [Plaintiff] never sought to enjoin [defendant] from the allegedly infringing conduct in its prayer for relief. [Plaintiff's] threats of 'full-scale litigation,' 'protracted discovery,' and a settlement demand escalator should [defendant] file responsive papers, were aimed at convincing [defendant] that a pay-off was the lesser injustice." The court granted defendant's motion to stay pending inter partes review because the lack of undue prejudice, potential simplification of issues, stage of the case, and reduction of the burden of litigation weighed in favor of a stay. "The fact that [defendant] is seeking a stay at the earliest stage of the litigation diminishes the potential effect of any tactical disadvantage [plaintiff] could face. . . . Additionally, [plaintiff's] own delay, waiting [2 years] to file the Complaint, further indicates that [plaintiff] will not suffer undue prejudice from a stay. . . . If competition for market share was a serious concern, [plaintiff] surely would have filed sooner, rather than spend two years in discussions with [defendant]. Additionally, [plaintiff] has not sought a preliminary injunction in this litigation, which further supports the absence of [plaintiff's] concern regarding a pressing threat to [its] market share."